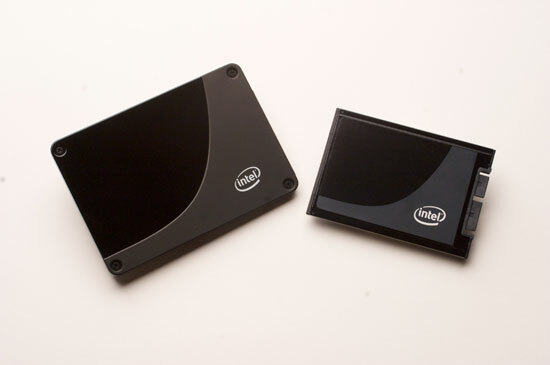 No one really paid much attention to Intel getting into the SSD (Solid State Disk) business. We all heard the announcements, we heard the claims of amazing performance, but I didn't really believe it. After all, it was just a matter of hooking up a bunch of flash chips to a controller and putting them in a drive enclosure, right? 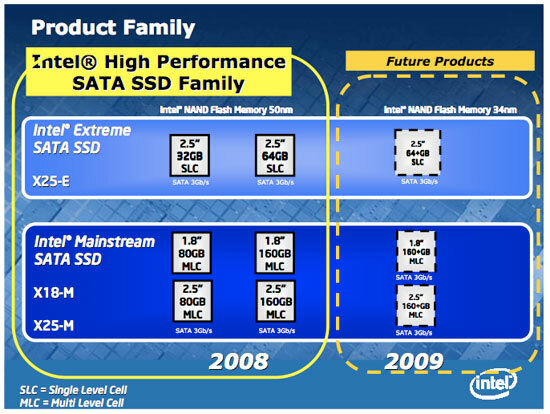 The closer we got to release and the more time I spent with competing products, the more I realized that Intel's biggest launch of 2008 wasn't going to be Nehalem - it was going to be its SSDs. If Intel could price them right, and if Intel could deliver on the performance, the biggest upgrade you could do for your PC - whether desktop or notebook, wouldn't be to toss in a faster CPU, it would be to migrate to one of these SSDs. Combine Nehalem and one of these mythical SSDs and you were in for a treat. But that was a big if...Intel still had to deliver. We already talked about the drives back at IDF. The Intel X25-M and the X18-M, available in 80GB capacities, 2.5" and 1.8" form factors (respectively) with 160GB versions on the way. Today we are allowed to share performance data and pricing information, one of which is more impressive than the other. Intel will be selling the X25-M at $595 MSRP through OEMs and channel vendors, although I hear the street price may be lower. Both of the -M models are based on Intel's MLC flash, while a X25-E using SLC flash will be due out by the end of this year. I'll detail the differences in a bit. The pricing is rough, that puts Intel's X25-M at cheaper than SLC drives on the market but more expensive than MLC drives. Your options are effectively to get a 128GB MLC drive, an 80GB Intel X25-M or a 64GB SLC drive. But as you can expect, I wouldn't be quite this excited if the decision were that easy. Over the next several pages we're going to walk through the architecture of a NAND flash based SSD, investigate the problems with current MLC drives (and show how the Intel drive isn't affected) and finally compare the performance of the Intel drive to MLC, SLC and standard hard drives (both 2.5" and 3.5") in a slew of real world applications. 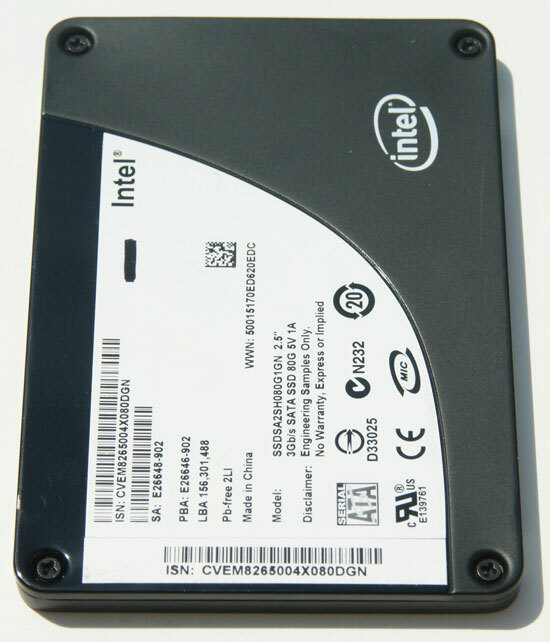 "I think Intel just Conroe’d the HDD market." Honestly, within 6 months I'd expect it to be just as important to have one of these drives in your system, as your boot/application drive, as it was to have Conroe in your system back in 2006. The only issue here, the only problem I have is the price. I was hoping for something much lower from Intel and although the pricing is justified based on the performance, it ensures that the X25-M like most high performance SSDs, remains a luxury item. While the X25-M isn't the world's fastest storage device across the board, it is among the fastest. And in the areas that it does dominate, it does so unbelievably well. The other great thing? You’ve got one of the world’s fastest hard drives, and it can fit in your notebook. Converting all your DVDs to divx is a silly idea. Why would you want to lose dynamic range and overall quality (no matter the settings) for a smaller movie size when 1TB costs 130$? Noise isnt a big problem on a 3.5" in a media pc as the other poster states. But heat can be a problem, especially if you plan on passively cool everything else in the computer. An SSD will solve both problems, but only if the SSD is the only disk in the system. From what I understand you want to have both in yours which makes sense since movies/music occupy a lot of space. In that case you will not experience any improved performance since the media would have to be read off the mechanical drive anyway. An SSD will not "solve" a heat problem. The hard drive adds only a small % of heat to a system and being lower heat density it has one of the less difficult requirements for cooling. Speed of the HTPC shouldn't be an issue, unlike a highly mixed use desktop scenario all one needs is to use stable apps without memory leaks then they can hibernate to get rid of the most significant boot-time waiting. Running the HTPC itself the OS performance difference would be trivial and the bitrate for the videos is easily exceeding by either storage type or an uncongested LAN. To be honest most decent HDDs don't make significant noise anyway, even further quelled by grommets or suspending the drive. Imaging you have a 80GB SSD, with 75GB been already occupied by some existing data (OS, installed software, etc), so you only have 10GB space left, now lets say you write and then erase 100GB/day on this SSD, shouldn't the 100GB/day data all be written on the 5GB space? So each cell would be written 100GB/5GB=20cycle/day, so you will reach the 10000cycle/cell limit within less than 18months. I remember reading a number of SSD reviews, but it's first time I read about the pauses. Indeed, quick search revealed 5 articles, starting from May 2007, but the conclusions only mentioned a high price and a small capacity as drawbacks. Nothing about freezing nor pauses. Some of these 5 probably were SCL-drives, some MLC. It's funny how a simple multitasking test can reveal an Achille's heel of large group of products, just when a product appears that doesn't suffer from this particular drawback. "each page contains 4 Kbytes of data, however, because of the parallelism at the back end of the controller, every access includes simultaneous opening of 16 pages for a total accessible data contingent of 64 Kbytes"
"No one really paid much attention to Intel getting into the SSD (Solid State Disk) business. We all heard the announcements, we heard the claims of amazing performance, but I didn't really believe it. After all, it was just a matter of hooking up a bunch of flash chips to a controller and putting them in a drive enclosure, right? " You mean you did not pay attention? I know I did, because Intel has always been serious with things of this nature. That and they are partnered with Crucial(Micron) right ?. . . Now if this was some attempt at sarcasm, or a joke . . . Seriously, and I mean VERY seriously, I was excited when Anandtech 'reported' that Intel/Micron were going to get into the SSD market. After all affordable SSDs are very desirable, never mind affordable/very good performing SSDs. That, and I knew if Intel got into the market, that we would not have these half-fast implementations that we're seeing now from these so called 'SSD manufactures'. Well, even Intel is not impervious to screw ups, but they usually learn by their mistakes quickly, and correct them. Micron (most notably Crucial) from my experience does not like to be anything but the best in what they do, so to me this seemed like a perfect team, in a perfect market. Does this mean I think Micron is the best ? Not necessarily. Lets me just say that after years of dealing with Crucial, I have a very high opinion of Crucial/Micron. "What can we conclude here? SSDs can be good for gaming, but they aren't guaranteed to offer more performance than a good HDD; and Intel's X25-M continues to dominate the charts." Are we reading the same charts ? These words coming from the mouth of someone who sometimes mentions even the most minuscule performance difference as being a 'clear winner' ? Regardless, I think it *is* clear to anyone willing to pay attention to the charts that the Intel SSD "dominates". Now whether the cost of admission is worth this performance gain is another story altogether. I was slightly surprised to see a performance gain in FPS just by changing HDDS, and to be honest I will remain skeptical. I suppose that some data that *could* effect FPS performance could be pulled down while the main game loop is running.